Over the past year or so, I’ve been highlighting the historic estates and mansions that have populated the shores of Geneva Lake in southeastern Wisconsin since the 1870s. While researching for my new book, Safe Refuge, I learned about an Irish settlement, called Irish Woods, located along the north shore of the lake. Not directly on the water where the large homes were being built, but a short distance inland. In the mid 1850’s, train track was laid between Elgin, Illinois and the town of Geneva, Wisconsin (the town wouldn’t start being called Lake Geneva, WI until later when, when at the request of the post office, they were asked to add ‘Lake’ to the name to help distinguish it from Geneva, Illinois). Many Irish immigrants were hired to lay the track, starting in Elgin Illinois and ending in Geneva. When they got to the end of the line, they had no way back to Elgin since trains wouldn’t start using the track right away. Rich farmland to the west of town was available, and many decided to stay. Some developed farms and others found employment, including helping to construct the new Catholic Church on the east side of the village. Over time, the area became known to the locals as Irish Woods. The original train track that brought the first Irish settlers to Irish Woods was only used for a few years before the train stopped running. In 1871, a new train track was built, this time between Chicago and Geneva. In October 1871, a few weeks after trains began regular runs to Geneva, the Great Chicago Fire ignited, and many more people came to the Geneva area via the new train to get away from the destruction. When the first young families staked their claims to the land in 1858, they needed a school for their children. 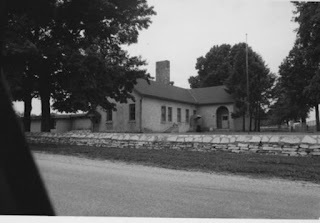 Property at the corner of State Highway 50 and the western end of Snake Road was donated, and the men of Irish Woods built a one-room frame schoolhouse. also built by one of the Irish Woods settlers. If you go to the school’s website, you can see how it looks today. 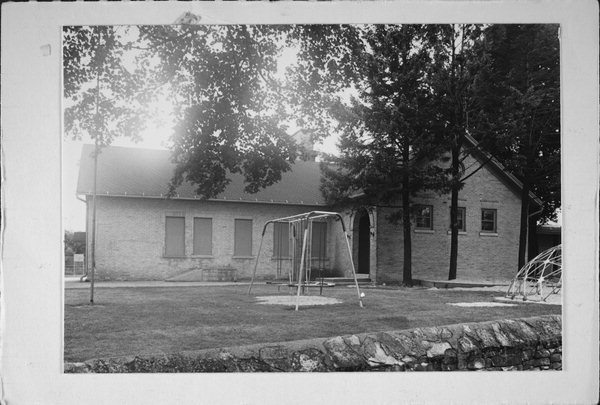 Just this past year the school was enlarged to almost double its size, but what is the original one-room brick building is still a visible part of the structure and now serves as the school’s library. I had a lot of fun including the Irish Woods settlement in my story. Nowadays, I enjoy driving past Woods School whenever I’m in the area and imagining what it must have been like back in the 19th Century when it was a one-room school. I only wish I’d known it’s history when I grew up in Lake Geneva. But then, I probably wouldn’t have been as interested back then as I am now. Did you attend a one-room school? Some of my classmates who came to the consolidated high school mentioned in this article did for at least part of their grade school years. I attended school in the town of Lake Geneva. 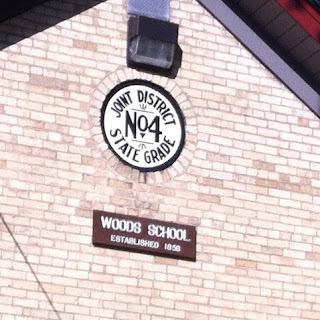 My building was newer than Woods School. It was built in 1903. 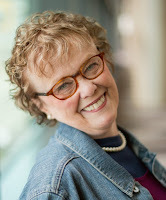 Pam has written most of her life, beginning with her first diary at age eight. 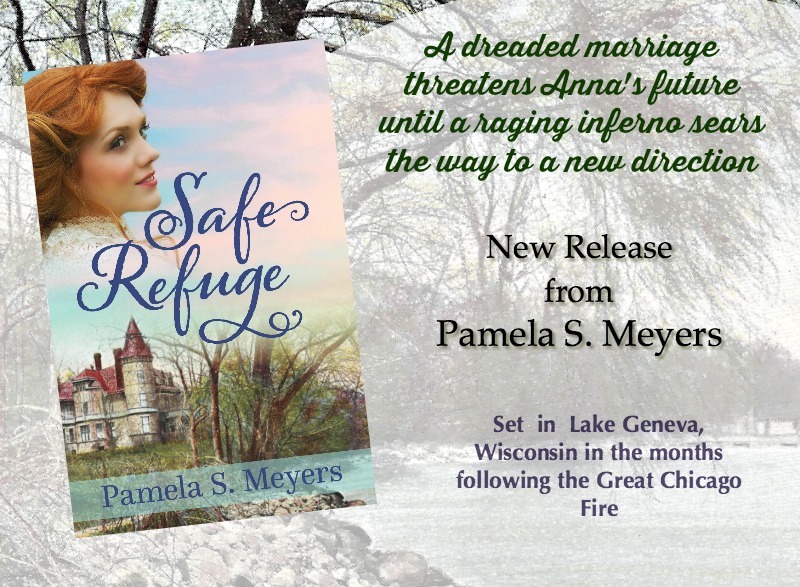 Her novels include Thyme For Love, Surprised by Love in Lake Geneva, Wisconsin (a reissue of Love Finds You in Lake Geneva, Wisconsin), Second Chance Love, and Safe Refuge. Whatever is True, a sequel to Second Chance Love, will publish in March 2019. Her novella, If These Walls Could Talk, was published in Coming Home: A Tiny House Collection. Pam resides in northern Illinois with her two rescue cats. She’s an hour or so away from her hometown where she can be found researching and nosing for new story ideas. My third and fourth grades were spent in a one-room schoolhouse. In my mom's day, the school held more grades, I believe. The school is now owned by the town's historical society. I love the post! Being a former teacher, I find this so very interesting. Thank you for sharing. Very interesting, Pamela. I love that they're still using the school. No, I didn't come from a one-room school house as we lived in or near towns that had 1-2 grades per class. On the opposite end of the scale, when we moved to the City of Winnipeg, I was blown away to be part of a Junior High school where there were four 30-33 students per class in each of the 3 junior grades of 7, 8, and 9. Not much variation in ages in that school. I love stories about old schoolhouses and how classes were taught and what was taught. How wonderful that it's still being used. The classes I taught in high school and college were so much larger, but I'm not sure I could have all the grades those early teachers did. I grew up in Dallas and in 1941 when I started kindergarten, they already had class rooms for separate grade levels. Great post Pam, love the pictures. When I was in the 1st-2nd grades the elementary school I attended was a one room classroom with several grades (don't remember what the grades were, that was a long time ago). Then in 3rd grade our new elementary school opened. I only attended that school half a year as we moved. Interesting research and pictures, Pam. I didn't attend a one room school; however, our rural community had a one room school house that was used for our neighborhood community monthly meetings. Lots of fun activities and memories of the past. I attended Woods for my whole K-8 schooling - it was the best place to learn and I have nothing but great memories there. I attended from 1970-1979. Thank you for this history and walking me down memory lane!